Y. Park, K. Huang, A. Paz y Puente, B.H. Sencer, J.R. Kennedy, Y.H. Sohn, “Diffusional Interaction between U-10wt.%Zr and Fe at 903K, 923K and 953K,” Metallurgical and Materials Transactions A, Accepted for Publication, 2014. A. Paz y Puente, J. Dickson, D.D. Keiser, Jr., Y.H. Sohn, Investigation of Interdiffusion Behavior in the Mo-Zr Binary System via Diffusion Couple Studies, Journal of Refractory Metals and Hard Materials, Accepted for Publication, 2014. J. Dickson, L. Zhou, A. Paz y Puente, M. Fu, D.D. Keiser, Jr., Y.H. Sohn,”Interdiffusion and Reaction between Zr and Al, Al-2wt.%Si, Al-5wt.%Si, or 6061 from 450° to 625°C,” Intermetallics, Accepted for Publication, 2014. Y. Park, J. Yoo, K. Huang, D.D. Keiser, Jr., J.F. Jue, B. Rabin, G. Moore, Y.H. Sohn, “Growth Kinetics and Microstructural Evolution during Hot Isostatic Pressing of U-10wt.%Mo Monolithic Fuel Plate in AA6061 Cladding with Zr Diffusion Barrier,” Journal of Nuclear Materials, 447 (2014) 215–224. K. Huang, C. Kammerer, D.D. Keiser, Jr., Y.H. Sohn, “Diffusion Barrier Selection from Refractory Metals (Zr, Mo and Nb) via Interdiffusion Investigation for U-Mo RERTR Fuel Alloy,” Journal of Phase Equilibria and Diffusion, Vol. 34 (2013) pp. 307-312. J. DeMarco, J. Karl, Y.H. Sohn, A. Gordon, “High-Temperature Mechanical Response of A359-SiCp-30%: Tensile Loading (II),” Materials at High Temperature, Vol. 30 (2013) pp. 224-235. J. DeMarco, J. Karl, Y.H. Sohn, A. Gordon, “High-Temperature Mechanical Response of A359-SiCp-30%: Tensile Loading (I),” Materials at High Temperature, Vol. 30 (2013) pp. 212-223. I.V. Belova, N.S. Kulkarni, Y.H. Sohn, G.E. Murch, “Simultaneous Measurement of Tracer and Interdiffusion Coefficients: An Isotopic Phenomenological Formalism for the Binary Alloys,” Philosophical Magazine A, Vol. 93, (2013) pp. 3515-3526. K. Huang, Y. Park, D.D. Keiser, Jr., Y.H. Sohn, “Interdiffusion between Potential Diffusion Barrier Mo and U-Mo Metallic Fuel Alloy for RERTR Applications,” Journal of Phase Equilibria and Diffusion, Vol. 34 (2013) pp. 307-312. E. Perez, D.D. Keiser, Jr., Y.H. Sohn, “Phase Development in a U-7wt.%Mo vs. Al-7wt.%Ge Diffusion Couple,” Journal of Nuclear Materials, Vol. 441 (2013) pp. 159-167. L. Momenzadeh, A.V. Evteev, E. Levchenko, I.V. Belova, G.E. Murch, Y.H. Sohn, “Phonon Thermal Conductivity of f.c.c. Cu by Molecular Dynamics Simulation,” Defects and Diffusion Forum, Vol. 336 (2013) pp. 169-184. K. Huang, H. Heinrich, D.D. Keiser, Jr., Y.H. Sohn, “Fuel-Matrix Chemical Interaction Between U-7wt.%Mo Alloy and Mg,” Defects and Diffusion Forum, Vol. 333 (2013) pp. 199-206. K. Huang, D.D. Keiser, Jr., Y.H. Sohn, “Interdiffusion, Intrinsic Diffusion, Atomic Mobility, and Vacancy Wind Effects in γ (bcc) Uranium-Molybdenum Alloy,” Metallurgical and Materials Transactions A, Vol. 44A (2013) pp. 738-746. E. Perez, Y.H. Sohn, D.D. Keiser, Jr., “Role of Si on Diffusional Interaction between U-Mo and Al-Si Alloys at 823K (550°C),” Metallurgical and Materials Transactions A, Vol. 44A (2013) pp. 584-595. K. Huang, Y. Park, D.D. Keiser, Jr., Y.H. Sohn, “Interdiffusion between Zirconium Diffusion Barrier and Uranium-Molybdenum Alloy,” Journal of Phase Equilibria and Diffusion, Vol. 33 (2012) pp. 443-449. C.C. Wei, A. Aitkaliyeva, Z. Luo, A. Ewh, Y.H. Sohn, J.R. Kennedy, B.H. Sencer, M.T. Myers, M. Martin, J. Wallce, M.J. General, L. Shao, “Understanding the Phase Equilibrium and Irradiation Effects in Fe-Zr Diffusion Couples,” Journal of Nuclear Materials, Vol. 432 (2012) pp. 205–211. Y. Lin, B. Yao, Z. Zhang, Y. Li, Y.H. Sohn, E.J. Lavernia, J.M. Schoenung, “Strain Energy During Mechanical Milling: Part II – Experimental,” Metallurgical and Materials Transactions A, Vol. 43A, (2012), pp. 4258-4265. Y. Lin, B. Yao, Z. Zhang, Y. Li, Y.H. Sohn, E.J. Lavernia, J.M. Schoenung, “Strain Energy During Mechanical Milling: Part I – Mathematical Modeling,” Metallurgical and Materials Transactions A, Vol. 43A, (2012), pp. 4247-4257. S. Brennan, K. Bermudez, N. Kulkarni, Y.H. Sohn, “Interdiffusion and Intrinsic Diffusion in Mg-Al System,” Metallurgical and Materials Transactions A, Vol. 43A, (2012), pp. 4043-4052. C. Bargraser, P. Mohan, K. Lee, B. Yang, J. Suk, S. Choe, Y.H. Sohn, “Life Approximation of Thermal Barrier Coatings via Quantitative Microstructural Analysis,” Materials Science and Engineering A, Vol. 549 (2012) pp. 76-81. S. Brennan, A. Warren, K.R. Coffey, N. Kulkarni, P. Todd, M. Klimov, Y.H. Sohn, “Aluminum Impurity Diffusion in Polycrystalline Magnesium,” Journal of Phase Equilibria and Diffusion, Vol. 33 (2012) pp. 121-125. K. Huang, Y. Park, A. Ewh, B.H. Sencer, J.R. Kennedy Jr., Y.H. Sohn, “Interdiffusion and Reaction Between Uranium and Iron,” Journal of Nuclear Materials, Vol. 424 (2012) pp. 82-88. Y.H. Sohn, T. Patterson, C. Hofmeister, C. Kammerer, W. Mohr, M. van den Bergh, M. Shaeffer, K. Cho, “Microstructural Evolution and Mechanical Properties of Trimodal Aluminum Metal Matrix Composites After Friction Stir Process,” Journal of Metals (JOM), Vol. 64-2 (2012) pp. 234-238. B. Yao, B. Simkin, B. Majumdar, C. Smith, M. van den Bergh, K. Cho, Y.H. Sohn, “Strain-induced Grain Growth of Cryomilled Nanocrystalline Aluminum in Trimodal Composites during Forging,” Materials Science and Engineering A, Vol. 536 (2012) pp. 103-109. M.F. Kilicaslan, W.R. Lee, Y.H. Sohn, S.J. Hong, “Effects of Sc Addition on the Microstructure and Mechanical Behavior of Atomized and Extruded Al-20wt.%Si Alloy,” Materials Letters, 71 (2012) pp. 164-167.
photopolymerization of pre-ceramic polymer" Sensors and Actuators: A. Physical, 95 (2-3): 120-134 (2002). B. Yao, E. Perez, D.D. Keiser, Jr., J.F. Jue, C.R. Clark, Y.H. Sohn, “Microstructure characterization of as-fabricated and 475ºC annealed U-7wt.%Mo dispersion fuel in Al-Si alloy matrix,” Journal of Alloys and Compounds, Vol. 509 (2011) pp. 9487-9496. M. Yang, R.D. Sisson, Jr., B. Yao, Y.H. Sohn, “Simulation of the Ferritic Nitriding Process,” International Heat Treatment and Surface Engineering, Vol. 5 (2011) pp. 122-126. E. Perez, D.D. Keiser, Jr., Y.H. Sohn, “Phase Constituents and Microstructure of Interaction Layer Formed in U-Mo Alloys vs. Al Diffusion Couple Annealed at 600°C,” Metallurgical and Materials Transactions A, Vol. 42 (2011) pp. 3071-3083. R. Mohanty, J. Bush, M.A. Okuniewski, Y.H. Sohn, “Thermotransport in γ(bcc) U-Zr Alloys: A Phase-Field Model Study,” Journal of Nuclear Materials, Vol. 414 (2011) pp. 211-216. A. Ewh, E. Perez, D.D. Keiser, Jr., Y.H. Sohn, “Characterization of Interaction Layer in U-Mo-X (X = Nb, Ti, Zr) vs. Al Diffusion Couples Annealed at 600°C for 10 hours,” Defects and Diffusion Forum, Vols. 312-315 (2011) pp. 1055-1062. D.D. Keiser, Jr., J.F. Jue, B. Yao, E. Perez, Y.H. Sohn, C.R. Clark, “Microstructural Characterization of U-7Mo/Al-Si Alloy Matrix Dispersion Fuel Plates Fabricated at 500°C, Journal of Nuclear Materials, Vol. 412 (2011) 90-99. K.A. Lee, Y.M. Jin, Y.H. Sohn, J. Namkung, M.C. Kim, “Continuous Strip Casting, Microstructure and Properties of Au-Sn Soldering Alloy,” Metals and Materials International, Vol. 17 (2011) pp. 7-14. B. Yao, H. Heinrich, K. Cho, Y.H. Sohn, “Hollow-Cone Dark-Field Transmission Electron Microscopy for Dislocation Density Characterization of Trimodal Al Composites,” Micron, Vol. 42 (2011) pp. 29-35. X. Zhang, K. Tamhane, T. Bera, J. Y. Fang, “Transcription of pH-Sensitive Supramolecular Assemblies into Silica: From straight, Coiled, and Helical Tubes to Single and Double Fan-Like Bundles”. Journal of Materials Chemistry 2011. 21, 13973. J. Zou, J. Y. Fang, “Synthesis of Adhesive Polymer Dispersed Liquid Crystal Films”. Journal of Materials Chemistry 2011, 21, 9149. J. Zou, T. Bera, A. Davis, W. Liang, J. Y. Fang, “Director Configuration Transition of Polyelectrolyte Encapsulated Liquid-Crystal Droplets”. Journal of Physical Chemistry B 2011. 115, 8970. W. Liang, T. Bera, X. Zhang, A. J. Gesquiere, J. Y. Fang, “Boojum and Stripe Textures in Long Range Orientationally Ordered Monolayers on substrates”. Langmuir 2011, 27, 1051. J. Qu, H. Xu, Z. Feng, D.A. Frederick, L. An and H. Heinrich. "Improving the tribological characteristics of aluminum alloys by forming a nanocomposite surface layer using friction stir processing" Wear, 271, 1940-45 (2011). Y. Wang, J. Ding, W. Feng and L. An. "Effect of pyrolysis temperature on the piezoresistivity of polymer derived ceramics" Journal of the American Ceramic Society, 94, 359-362 (2011). "Conical dark field scanning for grain size measurement in thin films", A. Darbal, K. Barmak, D. Choi, X. Liu, T. Sun, B. Yao, A. Warren, K. R. Coffey, Micron, submitted for publication. "Grain growth and the puzzle of its stagnation in thin Films: A detailed comparison of experiments and simulations", K. Barmak, E. Eggeling, R. Sharp, S. Roberts, T. Shyu, T. Sun, B. Yao, S. Ta’san, D. Kinderlehrer, A. Rollett, K. R. Coffey, Materials Science Forum, in press. H.J. Choi, J. Jedlinski, B. Yao, Y.H. Sohn, “Development of Thermally Grown Oxide on β-NiAl During Initial Stages of Oxidation at 1100°C,” Surface and Coatings Technology, Vol. 205 (2010) pp 1206-1210. C. Hofmeister, B. Yao, T. Delahanty, M. van den Burgh, K. Cho, Y.H. Sohn, “Composition and Structure of Nitrogen-containing Dispersoids in Tri-modal Aluminum Metal Matrix Composites,” Journal of Materials Science, Vol. 45 (2010) pp. 4871-4876. E. Perez, B. Yao, D.D. Keiser, Jr., Y.H. Sohn, “Microstructural Analysis of As-Processed U-10wt.%Mo Monolithic Fuel Plate in AA6061 Matrix with Zr Diffusion Barrier,” Journal of Nuclear Materials, Vol. 402 (2010) pp. 8-14. A. Ewh, E. Perez, D.D. Keiser, Jr., Y.H. Sohn, “Microstructural Characterization of U-Nb-Zr, U-Mo-Nb, and U-Mo-Ti Alloys via Transmission Electron Microscopy,” Journal of Phase Equilibria and Diffusion, Vol. 31 (2010) pp. 216-222. V.K. Champagne, M. Trexler, Y.H. Sohn, G.E. Kim, “Cold Spray Consolidation of Nanostructured AA5083 Aluminum Powders,” World Journal of Engineering, Supp. 2 (2010) pp. 260-261. B. Yao, T. Patterson, C. Hofmester, Y.H. Sohn, M. van den Bergh, C. Smith, T. Delahanty, K. Cho, “Microstructural Features Influencing the Strength of Commercial Scale Lightweight Nanoengineered Trimodal Aluminum Composites,” Composites Part A, Vol. 41 (2010) pp. 933-941. N. Garimella, H.J. Choi, Y.H. Sohn, “Determination of Average Ternary Interdiffusion Coefficients using Moments of Interdiffusion Flux and Concentration Profiles,” Defects and Diffusion Forum, Vol. 297-301 (2010) pp. 1328-1333. G.C. Jeong, H.J. Choi, Y.H. Sohn, S.I. Kwun, “Effects of Combined Surface Modification on Adhesion Strength of CrN Coatings for STS420,” Defects and Diffusion Forum, Vol. 297-301 (2010) pp. 1334-1339. N. Garimella, H.J. Choi, Y.H. Sohn, “Site Preference and Diffusion in Ni3Al Alloyed with Ir, Ta or Re at 1200°C,” Defects and Diffusion Forum, Vol. 297-301 (2010) pp. 1322-1327. P. Mohan, T. Patterson, B. Yao, Y.H. Sohn, “Environmental Degradation of Thermal Barrier Coatings and Mitigation by Electrophoretically Deposited Overlay,” Journal of Thermal Spray Technology, Vol. 19 (2010) pp. 156-167. X. Zhang, J. F. Fang, “Assembly of Vesicles into Fractal and Prong Patterns on Solid Substrates”. Soft Matter 2010, 6, 2139. K. Tamhane, X. Zhang, J. Zou, J. Y. Fang, “Assembly and Disassembly of Tubular Spherulites”. Soft Matter 2010, 6, 1224. (This paper is highlighted in Physics Week 2010, 06, 22). J. Zou, J. Y. Fang, “Director Configuration in Liquid-Crystals Droplets Encapsulated with Polyelectrolytes”. Langmuir 2010, 26, 7025. X. Zhang, M. Mathew, A. J. Gesquiere, J. Y. Fang, “Synthesis of Fluorescent Composite Tubes with pH-Controlled Shapes”. Journal of Materials Chemistry 2010, 20, 3716. Z. Zhang, J. Zou, K. Tamhane, F. Kobzeff, J. Y. Fang, “Self-Assembly of pH-Switchable Spiral Tubes: Supramolecular Springs”. Small 2010, 6, 217. "Grain size determination and grain boundary characterization of nanocrystalline thin films from conical dark field imaging", A. Darbal, K. Barmak, N. T. Nuhfer, T. Sun, K. R. Coffey, Proceedings of Microscopy and Microanalysis 15, Supplement 2, Pages 1232-1233, 2010. "Surface and grain boundary scattering in nanometric Cu films," T. Sun, B. Yao, A.P. Warren, K. Barmak, M.F. Toney, R.E. Peale, and K. R. Coffey, Physical Review B, Vol. 81, Article 155454, 2010. "High contrast hollow-cone dark field transmission electron microscopy for nanocrystalline grain size quantification," B. Yao, T. Sun, A. Warren, H. Heinrich, K. Barmak, and K. R. Coffey, Micron, Volume 41, Pages 177-182, 2010. "Effect of thin silicon dioxide layers on resonant frequency and amplitude in infrared metamaterials," D.J. Shelton, D.W. Peters, M.B. Sinclair, I. Brener, L.K. Warne, L.I. Basilio, K.R. Coffey, G. D. Boreman, Optics Express, Col. 18, Pages 1085-1090, 2010. "Experimental demonstration of tunable phase in a thermochromic infrared-reflectarray metamaterial," D.J. Shelton, K.R. Coffey, G. D. Boreman, Optics Express, Vol. 18, Pages 1330-1335, 2010. T. Jiang, A. Hill, W. Fei, Y. Wei, M. Tellam, C. Xu and L. An. "Making bulk ceramics from polymeric precursors" Journal of the American Ceramic Society, 93, 3017-3019 (2010). Y. Yu, L. An, Y. Chen and D. Yang. "Synthesis of SiFeC magnetoceramics from inverse polycarbosilane-based microemulsions" Journal of the American Ceramic Society, 93, 3324-3329 (2010). F. Gao, Y. Wang, L. Zhang, W. Yang and L. An. "Optical properties of Al-doped single-crystal Si3N4 nanowires" Journal of the American Ceramic Society, 93, 1364-1367 (2010). H. Wang, L. Lin, W. Yang, Z. Xie and L. An. "Preferred Orientation of SiC nanowires induced by substrates" Journal of Physical Chemistry C, 114, 2591-2594 (2010). W. Yang, F. Gao, G. Wei and L. An. "Ostwald ripening growth of silicon nitride nanoplates" Crystal Growth & Design, 10, 29-31 (2010). S. Sarkar, J. Zhou, C. Xu, L. An and L. Zhai. "Polymer-derived ceramic composite fibers with aligned pristine carbon nanotubes" ACS Materials & Interface, 2, 1150-1156 (2010). M. Yang, C. Xu, Y. Chao, K. Lin, H. Yang and L. An. 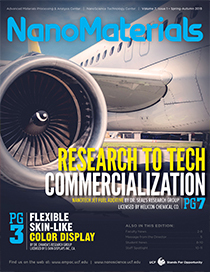 "Fabrication of AA6061/Al2O3 nano ceramic particle reinforced composite coating by using friction stir processing" Journal of Materials Science, 45, 4431-4438 (2010). F. Yang and L. An. "Stress analysis of the field-assisted sintering: electrothermal mechanical interaction" International Journal of Applied Electromagnetic & Mechanics, 32, 125-132 (2010). W. Yang, F. Gao, C. Xu, G. Wei and L. An. "Fabrication of Si3N4/SiC nanocomposites toughened by in-situ formed low-dimensional nanostructures" Solid State Science, 12, 1692-1695 (2010). W. Yang, F. Gao, Y. Fan, and L. An. "Al-doped single-crystalline SiC nanowires synthesized by pyrolysis of polymer precursors" Journal of Nanoscience & Nanotechnology, 10, 4729-4732 (2010). P. Mohan, B. Yao, T.J. Patterson, Y.H. Sohn, “Electrophoretically Deposited Alumina as Protective Overaly for Thermal Barrier Coatings Against CMAS Degradation, Surface and Coatings Technology, Vol. 204 (2009) pp. 797-801. E. Perez, A. Ewh, J. Liu, B. Yuan, D.D. Keiser, Y.H. Sohn, “Transmission Electron Microscopic Study of Phase Constituents in Al-rich U-Mo-Al Alloys,” Journal of Nuclear Materials, Vol. 394 (2009) pp. 160-165. R.R. Mohanty, J. Guyer, Y.H. Sohn, “Diffusion Under Temperature Gradient: A Diffuse Interface Study,” Journal of Applied Physics, Vol. 106 (3) 2009, 136915. E. Perez D.D. Keiser, Jr., Y.H. Sohn “Phase Constituents and Growth Kinetics of Aluminides in U-Mo vs. Al Diffusion Couples,” Defects and Diffusion Forum, Vol. 289-92 (2009) pp. 41-49. N. Garimella, M. Ikeda, M. Ode, H. Mukarami, Y.H. Sohn, “Effects of Ternary Alloying Addition of Re on Interdiffusion of L12-Ni3Al at 1200ºC,” Journal of Phase Equilibria and Diffusion, Vol. 30 (2009) pp. 246-252. Y. Zhao, L. An, J. Y. Fang, “Buckling Instability of Lipid Tubules with Multibilayer walls under Local Radial Indentation”. Physical Review E 2009. 80, 021911. (This paper is selected for publication in the August 24, 2009 issue of the Virtual Journal of Nanoscale Science & Technology and in the October 15, 2009 issue of the Virtual Journal of Biological Physics Research and highlighted in Vertical New 2009, 10, 18). U.S. Patent 7,633,065; Issued 12/15/2009, " Conduction structure for infrared microbolometer sensors " Inventors: Lian, Ming-Ren; Coffey, Kevin Robert. "Orientation Imaging of Nanocrystalline Platinum Films in the TEM", A. Darbal, K. Barmak,T. Nuhfer, D. J. Dingley, G. Meaden, J. Michael, T. Sun, K. R. Coffey, Proceedings of Microscopy and Microanalysis 15, Supplement 2,1232-1233(2009). "Excitation wavelength independent sensitized Er3+ concentration in as-deposited and low temperature annealed Si-rich SiO2 films," O. Savchyn, R. M. Todi, K. R. Coffey, L. K. Ono, B. R. Cuenya, P. G. Kik, Applied Physics Letters, vol. 95, Article 231109, 2009. "Thickness dependence of structure and magnetic properties of annealed [Fe/Pt]n multilayer films, " B. Yao and K.R. Coffey, Journal of Applied Physics, vol. 105, Article 07A726, 2009. "Observation of temperature-independent internal Er3+ relaxation efficiency in Si-rich SiO2 films," O. Savchyn, R. M. Todi, K. R. Coffey, and P. G. Kik, Applied Physics Letters, vol. 94, Article 241115, 2009. "Quantification of L10 phase volume fraction in annealed [Fe/Pt]n multilayer films," B. Yao and K.R. Coffey, Journal of Applied Physics, vol. 105, Article 033901, 2009. "Dominant role of grain boundary scattering in the resistivity of nanometric Cu films" T. Sun, B. Yao, A.P. Warren, K. Barmak, M.F. Toney, R.E. Peale, and K. R. Coffey, Physical Review B, vol. 79, Article 041402, 2009. H. Wang, Z. Xie, W. Yang, Y. Wang, F. Xing and L. An. "Morphology instability of Si3N4 nanowires" Journal of Physical Chemistry C, 113, 5902-5905 (2009). L. Zhang and L. An. "One-dimensional SiC/Si3N4: synthesis, growth mechanism, property and applications" Handbook of Nanoceramics and Their Based Nanodevices, eds. T. Tseng and H. S. Nalwa, American Scientific Publishers (ASP), 261-278, 2009. Y. Zhao, L. An and J. Fang. "Buckling instability of lipid tubules with multilayer walls under local radial indentation" Physical Review E 80, 021911 (2009). W. Yang, F. Gao, H. Wang, Z. Xie and L. An. "Asymmetric silicon nitride nanodendrites: addition and correction" Crystal Growth & Design, 9, 2020 (2009). Y. Wang, T. Jiang, L. Zhang and L. An. "Optical absorption of polymer-derived amorphous silicon carbonitrides" Journal of the American Ceramic Society, 92, 3111-3113 (2009). H. Wang, Z. Xie, Y. Wang, W. Yang, Q. Zeng, F. Xing and L. An. "Single-crystal AlN nanonecklaces" Nanotechnology, 20, 025611 (2009). W. Yang, F. Gao, H. Wang, Z. Xie, F. Xing and L. An. "Hollow alumina chain networks" Journal of the American Ceramic Society, 92, 280-282 (2009). T. Jiang, Y. Wang, Y. Wang, N. Orlovskaya and L. An. "Quantitative Raman analysis of free carbons in polymer-derived ceramics" Journal of the American Ceramic Society, 92, 2455-2458 (2009). Y. Wang, T. Jiang, L. Zhang and L. An. "Electron transport in polymer-derived amorphous silicon oxycarbonitride ceramics" Journal of the American Ceramic Society, 92, 1603-1606 (2009). J. Qu, H. Xu, Z. Feng, K. An, R. Battiste, H. Heinrich and L. An. "Forming Al-Al2O3 nanocomposite surfaces using friction stir processing" SME Transactions of NAMRI, 37, 349-356 (2009). Y. Wang, L. Zhang, Y. Fan, D. Jiang and L. An. "Stress dependent piezoresistivity in tunneling-percolation systems" Journal of Materials Science, 44, 2814-2819 (2009). Y. Wang, L. An, L.V. Saraf, C.M. Wang, V. Shutthanandan, D.E. McCready and S. Thevuthasan. "Fabrication and characterization of alternating-multilayer structures of gadolinia-doped ceria and zirconia grown by sputter-deposition" Journal of Materials Science, 44, 2021-2026 (2009). P. Mohan, V.H. Desai, Y.H. Sohn, “Degradation of Air Plasma Sprayed CoNiCrAlY Bond Coats in Thermal Barrier Coatings by Vanadium, Phosphorus and Sodium Compounds,” Surface and Coatings Technology, Vol. 203 (2008) pp. 427-431. R.R. Mohanty, Y.H. Sohn, “Microstructural Stability of fcc-γ+B2-β Coatings on γ Substrate in Ni-Cr-Al System – A Phase Field Model Study,” Surface and Coatings Technology, Vol. 203 (2008) 407-412. T. Patterson, A. Leon, B. Jayaraj, J. Liu, Y.H. Sohn, “Oxidation Behavior of Air Plasma Sprayed NiCoCrAlY Bond Coats in Air Plasma Sprayed Thermal Barrier Coatings,” Surface and Coatings Technology, Vol. 203 (2008) pp. 437-441. N. Garimella, M. Ikeda, M. Ode, H. Mukarami, Y.H. Sohn, “Effects of Ternary Alloying Addition of Ir and Ta on Interdiffusion of L12-Ni3Al at 1200ºC,” Intermetallics, Vol. 16 (2008) pp. 1095–1103. P. Mohan, B. Yuan, T. Patterson, V.H. Desai, Y.H. Sohn, “Degradation of Yttria Stabilized Zirconia Thermal Barrier Coatings by Molten CMAS (CaO-MgO-Al2O3-SiO2) Deposits,” Materials Science Forum, Vols. 595-598 (2008) pp. 207-212. R. Mohanty, Y.H. Sohn, “Phase Field Modeling of Interdiffusion Microstructure in Ni-Cr-Al Diffusion Couples,” Materials Science Forum, Vols. 595-598 (2008) pp. 199-206. N. Garimella, M.P. Brady, Y.H. Sohn, “Ternary and Quaternary Interdiffusion in γ (fcc) Fe-Ni-Cr-X (X = Si, Ge) Alloys at 900°C,” Materials Science Forum, Vols. 595-598 (2008) pp. 1145-1152. R. Mohanty, A. Leon, Y.H. Sohn, “Phase Field Simulation of Interdiffusion Microstructure Containing fcc-γ and L12-γ' Phases in Ni-Al Diffusion Couples,” Computational Materials Science, Vol. 43 (2008) pp. 301-308. H.S. Kim, Y.H. Sohn, T.G. Kim, J.M. Koo, S.J. Hong, “Thermal Stability, Microstructure and Mechanical Properties of Nanostructured Al-Ni-Mm-X (X = Cu and Fe) Alloys Hot-Extruded from Gas-Atomized Powders,” Materials Transactions, Vol. 49 (2008) pp.1223-1228. V. Krishnan, S. Bharani, J.S. Kapat, Y.H. Sohn, V.H. Desai, “A Simplistic Model to Study the Influence of Film Cooling on Low Temperature Hot Corrosion Rate in Coal Gas/Syngas Fired Gas Turbines,” International Journal of Heat and Mass Transfer, Vol. 51 (2008) pp. 1049-1060. M. Ikeda, N. Garimella, M. Ode, H. Mukarami, Y.H. Sohn, “Ternary Interdiffusion in Ni3Al with Ir Addition,” Defects and Diffusion Forum, Vol. 273-276 (2008) pp. 637-642. Y. Zhao, Z. Ge, J. Y. Fang, “Elastic Modulus of Viral Nanotubes”. Physical Review E 2008, 78, 031914. (This paper is selected for publication in the September 29, 2008 issue of the Virtual Journal of Nanoscale Science & Technology and in the October 1, 2008 issue of the Virtual Journal of Biological Physics Research). Y. H. Lin, H. Ren, Y. H. Wu, S. T. Wu, Y. Zhao, J. Y. Fang, “Electrically Tunable Wettability of Liquid Crystal/Polymer Composite Films”. Optics Express 2008, 16, 17591. (It is selected for publication in the December 1, 2008 issue of the irtual Journal for Biomedical Optics). H. Wang, Z. Xie, W. Yang, J. Y. Fang, L. N. An, “Morphology Control in Vapor-Liquid- Solid Growth of SiC Nanowires”. Crystal Growth & Design 2008, 8, 3893. Y. Zhao, J. Y. Fang, “Zigzag Lipid Tubules”. Journal of Physical Chemistry B 2008, 112, 10964. Y. Zhao, K. Tamhane, X. Zhang, L. An, J. Y. Fang, “Radial Elasticity of Self-Assembled Lipid Tubules”. ACS Nano 2008, 2, 1466. Y. Zhao, J. Y. Fang, “Direct Printing of Lipid Tubules”. Langmuir 2008, 24, 5113. "Relaxation time effects on dynamic conductivity of alloyed metallic thin films in the infrared band," D. Shelton, T. Sun, J. Ginn, K. Coffey, and G. Boreman, Journal of Applied Physics, vol. 104, Article. 103514, 2008. "Multilevel sensitization of Er3+ in low-temperature-annealed silicon-rich SiO2," O. Savchyn, R. M. Todi, K. R. Coffey, and P. G. Kik. Applied Physics Letters, vol. 93, Article 233120, 2008. "A high-throughput approach for cross-sectional transmission electron microscopy sample preparation of thin films," B. Yao and K. R. Coffey, Journal of Electron Microscopy, Vol. 57, no., 6, p. 189-194, 2008. "On the phase identification of dc magnetron sputtered Pt-Ru alloy thin films," A.P. Warren, R. M. Todi, K. Barmak, K.B. Sundaram, and K. R. Coffey, Journal of Vacuum Science and Technology, A, vol. 26, no. 26, p. 1208-1212, 2008. "Classical size effect in oxide-encapsulated Cu thin films: impact of grain boundaries versus surfaces on resistivity," T. Sun, B. Yao, A. P. Warren, S. Roberts, V. Kumar, K. Barmak, K. R. Coffey, Journal of Vacuum Science and Technology, A, vol. 26, no. 4, p. 605-609, 2008. "Grain growth and void formation in dielectric-encapsulated Cu thin films," B. Yao, T. Sun, V. Kumar, K. Barmak, K. R. Coffey, Journal of Materials Research, vol. 23, no. 7, p. 2033-2039, 2008. "Effect of hydrogen passivation on lumimescence-center-mediated Er excitation in Si rich SiO2 with and without Si nanocrystals," O. Savchyn, P. G. Kik, R. M. Todi, K. R. Coffey, H. Nukala, and H. Heinrich, Physical Review B, vol. 77, no. 20, Article 205438, 2008. "The effective interdiffusivity, structure, and magnetic properties of [Fe/Pt](n) multilayer films", B. Yao, and K.R. Coffey, Journal of Applied Physics, Vol. 103, no. 7, Article 07E107, 2008. Y. Zhao, K. Tamhane, X. Zhang, L. An and J. Fang. "Heterogeneous elasticity of self-assembled lipid tubules" ACS Nano, 2, 1466-1472 (2008). W. Yang, F. Gao, H. Wang, Z. Xie and L. An. "Asymmetric Si3N4 nanodendrites" Crystal Growth & Design, 8, 2606-2608 (2008). F. Gao, W. Yang, H. Wang, Y. Fan and L. An. "Controlled Al-doped single-crystalline 6H-SiC nanowires" Crystal Growth & Design, 8, 1461-1464 (2008). H. Wang, Z. Xie, W. Yang, J. Fang and L. An. "Morphology control in the vapor-liquid-solid growth of SiC nanowires" Crystal Growth & Design, 8, 3893-3896 (2008). W. Yang, X. Cheng, H. Wang, Z. Xie, F. Xing and L. An. "Bundled silicon nitride nanorings" Crystal Growth & Design, 8, 3921-3923 (2008). Y. Wang, L. Zhang, W. Xu, T. Jiang, Y. Fan, D. Jiang and L. An. "Effect of thermal initiator concentration on electrical behavior of polymer-derived amorphous SiCN ceramics" Journal of the American Ceramic Society, 91 , 3971-3975 (2008). K. Chen, X. Zhang, H. Wang, L. Zhang, F. Yang, J. Zhu and L. An. "Making nanostructured ceramics from micrometer-sized powders via grain refinement during SPS sintering" Journal of the American Ceramic Society, 91, 2475-2480 (2008). L. Zhang, Y. Wang, Y. Wei, W. Xu, D. Fang, L. Zhai, K. Lin and L. An. "A silicon carbonitride ceramic with anomalously high piezoresistivity" Journal of the American Ceramic Society, 91, 1346-1349 (2008). S. Sarkar, A. Chunder, W. Fei, L. An and L. Zhai. "Superhydrophobic mats of polymer derived ceramic fibers" Journal of the American Ceramic Society, 91, 2751-2755 (2008). W. Yang, H. Wang, X. Cheng, Z. Xie and L. An. "Perfect single-crystal Al2O3 microspheres" Journal of the American Ceramic Society 91, 2732-2735 (2008). W. Yang, F. Gao, H. Wang, Z. Xie and L. An. "Synthesis of ceramic nanocomposite powders via in-situ formation of nanowires/nanobelts" Journal of the American Ceramic Society, 91, 1312-1315 (2008). F. Gao, W. Yang, Y. Fan and L. An. "Aligned ultra-long single-crystalline α-Si3N4 nanowires" Nanotechnology, 19, 105602 (2008). F. Gao, W. Yang, Y. Fan and L. An. "Mass production of very thin single crystalline silicon nitride nanobelts" Journal of Solid State Chemistry, 181, 211-215 (2008). J. Luo, S. Liu, Y. Fan, L. Wang, L. Zhang, P. Zhang and L. An. "Effect of mechanical milling on photoluminescence of γ-alumina nanoparticles" Journal of Nanoscience & Nanotechnology, 8, 1414-1416 (2008). L. Wang, L. Zhang, Y. Fan, J. Luo, P. Zhang and L. An. "Effect of Nd-doping on the optical properties of YAG nanopowders" Journal of Nanoscience & Nanotechnology, 8, 1454-1457 (2008). W. Yang, H. Wang, S. Liu, Z. Xie and L. An. "Catalyst and temperature dependent growth of silicon nitride micro/nanoribbons" Journal of Nanoscience & Nanotechnology, 8, 3926-3929 (2008). J.R. Croy, S. Mostafa, J. Liu, Y.H. Sohn, H. Heinrich, B. Roldan-Cuenya, “Support Dependence of MeOH Decomposition Over Size-Selected Pt Nanoparticles,” Catalysis Letters, Vol. 119 (2007) pp. 209-216. P. Mohan, B. Yuan, V.H. Desai, Y.H. Sohn, “Degradation of Yttria Stabilized Zirconia Topcoat in Thermal Barrier Coatings by V2O5 and P2O¬5” Journal of the American Ceramic Society, Vol. 90 (2007) pp. 3601-3607. J.R. Croy, S. Mostafa, J. Liu, Y.H. Sohn, B. Roldan-Cuenya, “Size Dependent Study of MeOH Decomposition Over Size-Selected Pt Nanoparticles Synthesized via Micelle Encapsulation,” Catalysis Letters, Vol. 118 (2007) pp. 1-7. E. Perez, N. Hotaling, A. Ewh, D.D. Keiser, Y.H. Sohn, “Growth Kinetics of Intermetallic Phases in U-Mo vs. Al Alloy Diffusion Couples at 550ºC,” Defects and Diffusion Forum, Vol. 266 (2007) pp. 149-156. N. Garimella, M.P. Brady, Y.H. Sohn, “Interdiffusion in γ (fcc) Ni-Cr-X (Al, Si, Ge or Pd) Alloys at 900ºC,” Defects and Diffusion Forum, Vol. 266 (2007) pp. 191-198. J.W. Byeon, J. Liu, M. Hopkins, W. Fischer, N. Garimella, K.B. Park, M.P. Brady, M. Radovic, T. El-Raghy, Y.H. Sohn, “Microstructure and Residual Stress of Alumina Scale Formed on Ti2AlC at High Temperature in Air,” Oxidation of Metals, Vol. 68 (2007) pp. 97-111. Y. Zhao, J. Liu, Y.H. Sohn, J. Fang, “Synthesis of Hybrid Silica-Lipid Cylinders with Nanoscale Helical Rippling,” Journal of Chemical Physics C, vol. 111 (2007) pp. 6418-6421. Y.H. Sohn, E. Perez, N. Garimella, R. Mohanty, J. Liu, “Integrated, Effective and Average and Their Applications in Multicomponent Alloys for Energy Production Systems,” Defects and Diffusion Forum, Vol. 258-260 (2007) pp. 346-359. *A figure from the above publication was selected as a cover illustration of Defects and Diffusion Forum, Vol. 258-260 (2007). J. Y. Fang, “Ordered Arrays of Self-Assembled Lipid Tubules: Fabrication and Applications.” Journal of Materials Chemistry. 2007, 17, 3479. (Feature Article). Y. Zhao, L. An, J. Y. Fang, “Buckling of Self-Assembled Lipid Tubules in Shrinking Liquid Droplets”. Nano Letters 2007, 7, 1360. L. Guo, P. Chowdhury, J. Y. Fang, F. Gai, “Heterogeneous and Anomalous Diffusion of Molecules inside Lipid Tubules”. Journal of Physical Chemistry B 2007, 111, 14244. H. T. Wang, G. Q. Liu, W. Y. Yang, L. Lin, Z. P. Xie, J. Y. Fang, L. N. An, “Bicrystal AIN Zigzag Nanowires Induced by Crystal Lattice Mismatch”. Journal of Physical Chemistry C 2007, 111, 17169. Y. Zhao, J. Liu, Y. Sohn, J. Y. Fang, “Synthesis of Hybrid Lipid-Silica Cylinders with Nanoscale Helical Ripples”. Journal of Physical Chemistry C 2007, 111, 6418. U.S. Patent 7,164,358; Issued 01/16/2007, "Frequency divider with variable capacitance." Inventors: Lian, Ming-Ren; Todi; Ravi; Coffey, Kevin; Sundaram, Kalpathy; Gadkari, Parag. U.S. Patent 7,170,174; Issued 01/30/2007, " Magnetic head having a heater circuit for thermally-assisted writing." Inventors: Coffey, Kevin Robert; Lille, Jeffrey Scott; Tam, Andrew Ching. "Experimental and Numerical Study of Dense Layered Nano-Energetic Materials, N. Amini, K. Coffey, and R. Kumar, Proceedings of IMECE2007, 2007. "Luminescence-center-mediated excitation as the dominant Er sensitization mechanism in Er-doped silicon-rich SiO2 films," O. Savchyn, F. R. Ruhge, P. G. Kik, R. M. Todi, K. R. Coffey, H. Nukala, and H. Heinrich. Physical Review B, vol. 76, article 195419. 2007. "Back-etch method for plan view transmission electron microscopy sample preparation of optically opaque films,´ B. Yao and K. R. Coffey, Journal of Electron Microscopy, Vol. 57, no., 2, p. 47-52, 2008. "The influence of periodicity on the structure and properties of annealed [Fe/Pt]n multilayer films," B. Yao and K. R. Coffey, Journal of Magnetism and Magnetic Materials, vol. 320, no. 3-4, p. 559-564, 2008. "Comparison of the Work Function of Pt-Ru Binary Metal Alloys Extracted from MOS Capacitor and Schottky Barrier Diode",R. M. Todi, M. S. Erickson, K. B. Sundaram, K. Barmak, K. R. Coffey, IEEE Transactions on Electron Devices, vol. 54, no. 4, p. 807-813, 2007. Y. Zhao, L. An and J. Fang. "Buckling of self-assembled lipid tubules and helical ribbons in shrinking liquid droplets" Nano Letters, 7(5), 1360-1363, (2007). S. Xu, Y. Fan, J. Luo, L. Zhang, W. Wang, B. Yao and L. An. "Phonon characteristics and photoluminescence of bamboo structured silicon-doped boron nitride nanotubes" Applied Physics Letters, 90, 013115 (2007). W. Yang, H. Wang, S. Liu, Z. Xie and L. An. "Controlled Al-doped single-crystalline silicon nitride nanowires synthesized via pyrolysis of polymer precursors" Journal of Physical Chemistry B, 111, 4156-4160 (2007). H. Wang, G. Liu, W. Yang, L. Lin, Z. Xie, J. Fang and L. An. "Bicrystal AlN zigzag nanowires" Journal of Physical Chemistry C, 111, 17169-17172 (2007). W. Yang, Z. Xie, H. Miao, L. Zhang and L. An. "Catalyst-assisted pyrolysis of polymeric precursors: a new method to synthesize low-dimensional nanomaterials" Key Engineering Materials, 336-338, 2138-2141 (2007). H. Wang, Z. Xie, W. Yang, G. Liu and L. An. "Fabrication of SiCN MEMS by UV lithography of polysilazane" Key Engineering Materials, 336-338, 1477-1480 (2007). R.R. Mohanty, Y.H. Sohn, “Phase-Field Investigation of Multicomponent Diffusion in Single-Phase and Two-Phase Diffusion Couples,” Journal of Phase Equilibria and Diffusion, Vol. 27 (2006) pp. 676-683. Y. Wang, Y. Fan, L. Zhang, Y.H. Sohn, L. An, “Oxygen Diffusion Through Al-Doped Amorphous SiO2,” Journal of Phase Equilibria and Diffusion, Vol. 27 (2006) pp. 671-675. N. Garimella, M. Brady, Y.H. Sohn, “Interdiffusion in γ (fcc) Ni-Cr-X (Al, Si, Ge or Pd) Alloys at 900ºC,” Journal of Phase Equilibria and Diffusion, Vol. 27 (2006) pp. 665-670. E. Perez, T. Patterson, Y.H. Sohn, “Interdiffusion Analysis for NiAl vs. Superalloys Diffusion Couples,” Journal of Phase Equilibria and Diffusion, Vol. 27 (2006) pp. 659-664. J. Liu, Y.H. Sohn, K.S. Murphy, “Microstructural Evolution of Durable Thermal Barrier Coatings with Hf and/or Y Modified Superalloy Substrates,” Materials Science Forum, Vol. 539-543 (2007) 1206-1211. Y. Zhong, J. Liu, R. Witt, Y.H. Sohn, Z.K. Liu, “Al2(Mg,Ca) Phases in Mg-Al-Ca System: First-Principles Prediction and Experimental Identification,” Scripta Materialia, Vol. 55 (2006) pp. 573-576. J. Liu, J.W. Byeon, Y.H. Sohn, “Effects of Phase Constituents and Microstructure in Thermally Grown Oxide on The Thermal Cycling Lifetime and Failure of Thermal Barrier Coatings,” Surface and Coatings Technology, vol. 200 (2006) pp. 5869-5876. B. Jayaraj, S. Vishweswaraiah, V.H. Desai, Y.H. Sohn, “Changes in Electrochemical Impedance with Microstructural Development in Thermal Barrier Coatings,” Journal of Metals, vol. 57 (2006) pp. 61-64. Y. Zhao, N. Mahajan, J. Y. Fang, “Fabrication of Self-Assembled Cylindrical Lipid Tubules with Birefringent Core”. Small 2006, 2, 364. Y. Zhao, N. Mahajan, S. Long, Q. Wang, J. Y. Fang, “Stability and Deformation of Virus Nanoparticles under Applied Load with Atomic Force Microscope”. Micro and Nano Letters 2006, 1, 1. Y. Zhao, N. Mahajan, J. Y. Fang, “Bending and Radial Deformation of Self-Assembled Hollow Cylindrical Lipid Tubules”. Journal of Physical Chemistry B 2006, 110, 22060. N. Mahajan, Y. Zhao, T. B. Du, J. Y. Fang, “Nanoscale Ripples in Self-Assembled Lipid Tubules”. Langmuir 2006, 22, 1973. Y. Zhao, J. Y. Fang, “Alignment and Positioning of Lipid Tubules on Patterned Au Substrates under Flow and Confinement”. Langmuir 2006, 22, 1892. Y. H. Lin, H. W. Ren, Y. H. Wu, Y. Zhao, J. Y. Fang, S. T. Wu, “IPS-LCD Using A Glass Substrate and an Anisotropic Polymer Film”. Journal of Display Technology 2006, 2, 21. J. Y. Fang, “Self-Assembled Lipid Tubules: Synthesis, Characterization, and Ordered Arrays”. Mater. Res. Soc. Symp. Proc. 2006, 922E-U05-02. U.S. Patent 6,982,843; Issued 01/03/2006, "Assembly Comprising Adjustable heat flux mechanism for thermally assisted/thermal information processing and control." Inventors: Coffey, Kevin Robert; Hamann; Hendrik F.; Thiele, Jan-Ulrich; Wickramasinghe, Hemantha Kumar. U.S. Patent 7,006,336; Issued 02/28/2006, " Magnetic head having a heater circuit for thermally-assisted writing." Inventors: Coffey, Kevin Robert; Lille, Jeffrey Scott; Tam, Andrew Ching. "A Modified Back-etch Method for Preparation of Plan View High Resolution Transmission Electron Microscopy Samples," B. Yao, R.V. Petrova, R.R. Vanfleet, K.R. Coffey, Journal of Electron Microscopy, Vol. 55, Issue 4, pages 209-214, 2006. "Characterization of Pt–Ru Binary Alloy Thin Films for Work Function Tuning," R. M. Todi, K. B. Sundaram, K. R. Coffey, IEEE Electron Device Letters, Vol. 27, Issue 7, pages 542-545, 2006. "X-ray photoelectron spectroscopy analysis of oxygen annealed radio frequency sputter deposited SiCN thin films," R. M. Todi, K. B. Sundaram, K. R. Coffey, Journal of the Electrochemical Society, Vol. 153, issue 7, pages G640-G643, 2006. "Compositional stability of FePt nanoparticles on SiO2/Si during annealing", B. Yao, R. V. Petrova, R. R. Vanfleet, V. Lam, and K.R. Coffey, Journal of Applied Physics, Vol. 99, Issue 8, Article No. 08E913, 2006. "Experimental study of the interaction of laser radiation with silver nanoparticles in SiO2 matrix," M. Sendova, M. Sendova-Vassileva, J. C. Pivin, H. Hofmeister, K. Coffey, A. Warren,Journal of Nanoscience and Nanotechnology, Vol. 6, Issue 3, pages 748-755, 2006. L. Zhang, W. Yang, H. Jin, Z. Zheng, Z. Xie, H. Miao and L. An. "Ultraviolet photoluminescence from 3C-SiC nanorods" Applied Physics Letters, 89, 143101 (2006). S. Liu, L. Zhang, Y. Fan, J. Luo, P. Zhang and L. An. "Ultraviolet irradiation-induced photoluminescence degradation in g-alumina nanoparticles" Applied Physics Letters, 89, 051911 (2006). W. Yang, Z. Xie, H. Miao, L. Zhang and L. An. "Coalescence of nanobranches: a new growth mechanism for single-crystalline nanobelts" Journal of Physical Chemistry B, 110, 3969-3972 (2006). Y. Wang, Y. Fan, L. Zhang, W. Zhang and L. An. "Polymer-derived SiAlCN ceramics resist to oxidation at 1400oC" Scripta Materialia, 55, 295-297 (2006). Y. Wang, W. Fei, Y. Fan, L. Zhang, W. Zhang and L. An. "A silicoaluminum carbonitride ceramic resist oxidation/corrosion in water vapor" Journal of Material Research, 21, 1625-1628 (2006). L. Wang, L. Zhang, Y. Fan, J. Luo, P. Zhang and L. An. "Synthesis of Nd/Si Co-doped YAG powders via a solvothermal method" Journal of the American Ceramic Society, 89, 3570-3572 (2006). Y. Wang, W. Fei and L. An. "Oxidation/hot-corrosion of polymer-derived SiAlCN ceramics in water vapor" Journal of the American Ceramic Society, 89, 1079-1082 (2006). Y. Fan, Y. Wang, J. Lou, S. Xu, L. Zhang, H. Heinrich and L. An. "Formation of silicon-doped boron nitride bamboo structures via pyrolysis of polymeric precursor" Journal of the American Ceramic Society, 89, 740-742 (2006). B. Prabhu, C. Suryanarayana, L. An and R. Vaidyanathan. "Synthesis and characterization of high volume fraction Al-Al2O3 nanocomposite powders by high-energy milling" Materials Science and Engineering A-Structural Materials Properties, Microstructure and Processing, 425, 192-200 (2006). W. Yang, Z. Xie, H. Miao, L. Zhang and L. An. "Fabrication of Si3N4/SiC nanocomposites by spark plasma sintering of amorphous SiCN powders" Journal of Ceramic Processing Research, 7 (4): 307-310 (2006). Y. Wang, Y. Fan, L. Zhang, Y. Sohn and L. An. "Oxygen diffusion through aluminum-containing amorphous SiO2" Journal of Phase Equilibria and Diffusion, 27, 671-675 (2006). N.R. Nagaiah, J.S. Kapat, L. An and L. Chow. "Novel polymer derived ceramic-high temperature heat flux sensor for gas turbine environment" Journal of Physics: Conference Series, 34, 458-463 (2006). N.R. Nagaiah, A.K. Sleiti, S. Rodriguez, J.S. Kapat, L. An and L. Chow. "A novel design and analysis of a MEMS ceramic hot-wire anemometer for high temperature applications" Journal of Physics: Conference Series, 34, 277-282 (2006). J.W. Byeon, S.I. Kwun, S.J. Hong, C.K. Lee, K.M. Kang, Y.H. Sohn, “Correlation of Magnetic Barkhausen Emission Profile with Strength of Thermally Degraded 2.25Cr-1Mo Steel,” Materials Transactions of The Japan Institute of Metals, Vol. 46 (2005) pp. 1-3. B. Franke, Y.H. Sohn, X. Chen, J.R. Price, Z. Mutasim, “Monitoring Damage Evolution in Thermal Barrier Coatings with Thermal Wave Imaging,” Surface and Coatings Technology, Vol. 200 (2005) pp. 1292-1297. J. Byeon, B. Jayaraj, S. Vishweswaraiah, V.H. Desai, Y.H. Sohn, “Non-Destructive Evaluation of Degradation in Multi-Layered Thermal Barrier Coatings by Electrochemical Impedance Spectroscopy,” Materials Science and Engineering A, Vol. 407 (2005) pp. 213-225. Y.H. Sohn, A. Puccio, M.A. Dayananda, “Diffusion Structures and Diffusion Paths of Selected Multiphase Couples in the Fe-Ni-Al System,” Metallurgical and Materials Transactions A, Vol. 36A (2005) pp. 2361-2370. J.W. Byeon, S. Laxman, Y.H. Sohn, “Transmission Electron Microscopy of Isothermally Oxidized EB-PVD Thermal Barrier Coatings on (Ni,Pt)Al Bondcoat,” Materials Science Forum, Vol. 486-487 (2005) pp. 149-152. J.W. Byeon, B. Jayaraj, Y.H. Sohn, “Characterization of Isothermally Oxidized ZrO2-8wt.%Y2O3 Thermal Barrier Coatings by Electrochemical Impedance Spectroscopy,” Materials Science Forum, Vol. 486-487 (2005) pp. 145-148. J.W. Byeon, N. Mu, J. Liu, Y.H. Sohn, “Characterization of Long-Term Oxidized Nickel Aluminide Coating by Photoluminescence Spectroscopy,” Materials Science Forum, Vol. 486-487 (2005) pp. 141-144. N. Mu, J. Liu, Y.H. Sohn, Y.L. Nava, “Long-term Oxidation and Phase Transformations in Aluminized CMSX-4 Superalloys,” Surface and Coatings Technology, Vol. 188-189 (2005) pp. 27-34. Y. Zhao, N. Mahajan, R. Lu, J. Y. Fang, “Liquid-Crystal Imaging of Molecular-Tilt Organization in Self-Assembled Tubules of Chiral Phospholipids”. Proceedings of the National Academy of Sciences USA 2005, 102, 7438. (It is highlighted in This Week of Proc. Natl. Acad. Sci. USA). C. Whitehouse, J. Y. Fang, A. Aggeli, M. Bell, R. M. Brydson, C. W. G. Fishwick, C. M. Knobler, J. Henderson, R. W. Owens, N. H., Thomson, N. Boden, “Adsorption and Self-assembly of Peptides on Substrates”. Angewandte Chemie International Edition 2005, 44, 1965. (It is listed as VIP paper and highlighted in Chemie ED News-Press Release). N. Mahajan, J. Y. Fang, “Two-Dimensional Ordered Arrays of Aligned Lipid Tubules on Substrates with Microfluidic Networks”. Langmuir 2005, 21, 3153. (It is featured on the cover of Langmuir and is highlighted on News Section of Analytical Chemistry). Y. H. Lin, H. W. Ren, Y. H. Wu, Y. Zhou, Y. Zhao, S. Gauza, J. Y. Fang, S. T. Wu, “Polarization-independent Liquid Crystal Phase Modulators using a Thin Polymer-Separated Double-Layered Structure.” Optics Express 2005, 13, 8746. N. Mahajan, R. Lu, S. T. Wu, J. Y. Fang, “Patterning Polymerized Lipid Vesicles with Soft Lithography”. Langmuir 2005, 21, 3132. "Characterization of Individual L10 FePt Nanoparticles," R. V. Petrova, R. R. Vanfleet, D. Richardson, B. Yao, and K. R. Coffey, IEEE Transactions on Magnetics, vol. 41, Issue 10, pages 3202-3204, 2005. "On the relationship of magnetocrystalline anisotropy and stoichiometry in epitaxial L1(0) CoPt (001) and FePt (001) thin films," K. Barmak, J. Kim, K. R. Coffey, M. F. Toney, A. J. Kellock, J.-U. Thiele, Journal of Applied Physics, Vol. 98, Issue 3, Article 033904, Aug. 2005. "Comparison of the agglomeration behavior of thin metallic films on SiO2," P. R. Gadkari, A. P. Warren, R. M. Todi, R. V. Petrova, and K. R. Coffey, Journal of Vacuum Science and Technology A, Vol. 23, Issue 4, pp. 1152-1161, Jul.-Aug. 2005. "Growth and characterization of sputtered BSTO/BaM multilayers," S. Srinath, N. A. Frey, R. Heindl, H. Srikanth, K. R. Coffey, and N. J. Dudney,Journal of Applied Physics, Vol. 97, Issue 10, Article 10J115, May 2005. L. Zhang, H, Jin, W. Yang, Z. Xie, H. Miao and L. An. "Optical properties of single-crystalline α-Si3N4 nanobelts" Applied Physics Letters, 86, 061908 (2005). W. Yang, Z. Xie, H. Miao, L. Zhang, H. Ji and L. An. "Synthesis of single-crystalline silicon nitride nanobelts via catalyst-assisted pyrolysis of a polysilazane" Journal of the American Ceramic Society, 88, 466-469 (2005). Y. Wang, Y. Fan, L. Zhang, S. Burton, Z. Gan and L. An. "Oxidation of polymer-derived SiAlCN ceramics" Journal of the American Ceramic Society, 88, 3075-3080 (2005). S. Liu, W. Fei, L. Zhang, H. Heinrich and L. An. "Phase transformation of mechanically-milled nano-sized γ-alumina" Journal of the American Ceramic Society, 88, 2559-63 (2005). A. Dhamne, W. Xu, B. Fookes, Y. Fan, L. Zhang, S. Burton, J. Hu, J. Ford and L. An. "Polymer-ceramic conversion of liquid polyaluminasilazanes for SiAlCN ceramics" Journal of the American Ceramic Society, 88, 2415-19 (2005). W. Yang, Z. Xie, J. Li, H. Miao, L. Zhang, H. Ji and L. An. "Ultra-long single-crystalline α-Si3N4 nanowires: derived from a polymeric precursor" Journal of the American Ceramic Society, 88, 1647-50 (2005). Y. Wang, C. Suryanarayana and L. An. "Phase transformation of γ-Al2O3 during high-energy ball milling" Journal of the American Ceramic Society, 88, 780-783 (2005). W. Yang, Z. Xie, J. Ma, H. Miao, J. Luo, L. Zhang and L. An. "Polygonal single-crystalline aluminum borate microtubes" Journal of the American Ceramic Society, 88, 485-487 (2005). Y. Wang, L. Zhang, Y. Fan, J. Luo, D. McCready, C. Wang and L. An. "Synthesis, characterization and optical properties of pristine and doped-YAG nanopowders" Journal of the American Ceramic Society, 88, 284-286 (2005). W. Yang, Z. Xie, H. Miao, L. Zhang and L. An. "Simultaneous growth of silicon nitride nanobelts and nanodendrites by catalyst-assisted crystallization of amorphous SiCN" Journal of Crystal Growth, 276, 1-6 (2005). H. Jin, L. Zhang, Z. Zheng, L. An, Y. Lu, J. Zhang, X. Fan, D. Shen. "Temperature-dependent photoluminescence in coupling structures of CdSe quantum dots and a ZnCdSe quantum well" Chinese Physics Letters, 6, 1518-21 (2005). W. Yang, L. Zhang, X. Zhipeng, H. Miao and L. An. "Growth and optical properties of ultra-long single-crystalline α-Si3N4 nanobelts" Applied Physics A-Materials Science & Processing, 80, 1419-1423 (2005). Z. Xie, W. Yang, H. Miao, L. Zhang and L. An. "Synthesis and growth mechanism of silicon nitride nanostructures" Materials Science Forum, 475-479, 1239-1242 (2005). L. Zhang, Y. Fan, J. Lou, M. Chu, Y. Wang, L. Bharadwaj and L. An. "Silicoaluminum carbonitride with anomalously high resistance to oxidation and hot corrosion" Rare Metal Materials and Engineering, 34, 486-489 (2005). Y. Fan, J. Luo, Y. Wang, S. Xu, M. Chu, W. Wang, L. Zhang and L. An. "The study on pyrolysis mechanism in Si-B-C-N polymer-to-ceramic transformation by FTIR and resonance Raman spectra" Rare Metal Materials and Engineering, 34, 490 (2005). Y. Miao, S. Liu, J. Luo, Y. Wang, S. Xu, W. Wang, Y. Fan, L. Zhang, and L. An. "Preparation of SiCp/Al nano-composites with two-step sintering processing" Rare Metal Materials and Engineering, 34, 632 (2005). P. Zhang, G. Wu, X. Chi, Y. Wang, S. Liu and L. An. "Preparation and properties of toughened colorful zirconia ceramics" Rare Metal Materials and Engineering, 34, 650 (2005). Y. Wang, L. Zhang, S. Xu, Y. Miao, Y. Fan, W. Wang and L. An. "Electrical conductivity of amorphous Si-B-C-N precursor-derived ceramics" Rare Metal Materials and Engineering, 34, 948 (2005). S. Xu, L. Zhang, Y. Wang, Y. Miao, Y. Fan, J. Luo, W. Wang and L. An. "Boron dopant dependence of electrical conductivity of amorphous SiCN ceramics" Rare Metal Materials and Engineering, 34, 952 (2005). Y. Fan, J. Luo, W. Yang, Z. Xie and L. An. "Photoluminescence and photoluminescence excitation of single crystalline α-Si3N4 nanobelts" Rare Metal Materials and Engineering, 34, 956 (2005). Y. Miao, W. Wang, M. Chu, Y. Fan, J. Luo, L. Zhang and L. An. "High temperature conductivity of amorphous SiCN ceramics" Journal of the Chinese Ceramics Society, 33, 789 (2005). Y.H. Sohn, B. Jayaraj, S. Laxman, B. Franke, J.W. Byeon, A.M. Karlsson, “Non-Destructive and Microstructural Characterization of Thermal Barrier Coatings,” Journal of Metals, Vol. 56 (2004) 53-56. B.W. Kempshall, S.K. Jha, Y.H. Sohn, R.R. Vanfleet, J. Kimmel, “An Observation of Nearly Failed Electron Beam Physical Vapor Deposited Thermal Barrier Coating with Grit Blasted (Ni,Pt)Al Bond Coat: Photostimulated Luminescence and Transmission Electron Microscopy,” Thin Solid Films, Vol. 466 (2004) pp. 128-136. L. An, Y. Wang, L. Bharadwaj, L. Zhang, Y. Fan, D. Jiang, Y.H. Sohn, V.H. Desai, J. Kapat, L. Chow, “Silicoaluminum Carbonitride with Anomalously High Resistance to Oxidation and Hot Corrosion,” Advanced Engineering Materials, Vol. 6 (2004) pp. 337-340. S.K. Jha, Y.H. Sohn, N. Gunda, S. Sastri and A.J. Haynes, “Al-O-N Based Duplex Coating System for Improved Oxidation Resistance for Superalloys and NiCrAlY Coatings”, Surface and Coatings Technology, 183 (2004) pp. 224-232. B. Jayaraj, V.H. Desai, C.K. Lee, Y.H. Sohn, “Electrochemical Impedance Spectroscopy of Porous ZrO2 – 8 wt.% Y2O3 and Thermally Grown Oxide on Nickel Aluminide,” Materials Science and Engineering A, Vol. A372 (2004) pp. 278-286. Y.S. Kim, G.L. Hofman, S.L. Hayes, Y.H. Sohn, “Constituents Redistribution in U-Pu-Zr Fuel During Irradiation, Journal of Nuclear Materials, Vol. 327 (2004) pp. 27-36. B. Jayaraj, S. Vishweswaraiah, V.H. Desai, Y.H. Sohn, “Electrochemical Impedance Spectroscopy of Thermal Barrier Coatings as a Function of Isothermal and Cyclic Thermal Exposure,” Surface and Coatings Technology, Vol. 177-178 (2004) pp. 140-151. A.J. Burns, R. Subramanian, B.W. Kempshall, Y.H. Sohn, “Microstructure of As-Coated Thermal Barrier Coatings with Varying Lifetimes,” Surface and Coatings Technology, Vol. 177-178 (2004) pp. 89-96. S. Laxman, B. Franke, B.W. Kempshall, Y.H. Sohn, L.A. Giannuzzi, K.S. Murphy, “Phase Transformation of Thermally Grown Oxide on (Ni,Pt)Al Bond Coat During Electron Beam Physical Vapor Deposition and Subsequent Oxidation,” Surface and Coatings Technology, Vol. 177-178 (2004) pp. 121-130. I. Stanish, D. A. Lowy, Y. W. Lee, J. Y. Fang, E. Wong, R. Ray, A. Singh, “Structural and Electrochemical Characterization of Immobilized Polymerized Electroactive Lipid Vesicles”. Journal of Physical Chemistry B 2004, 108, 127. J. Y. Fang, “Viral Nanoparticles: Adsorption and Self-Organization on Surfaces”. Ency of Nanoscience & Nanotechnology 2004, 5, 3953. Invited Review Article. "Temperature dependence of the magnetization reversal of thin film longitudinal magnetic recording media," K.R. Coffey, J.-U. Thiele, and T. Thomson, IEEE Transactions on Magnetics, Vol. 40, Issue 4, pp. 2440-2442, July 2004. "Stoichiometry-anisotropy connections in epitaxial FePt(001) films," K. Barmak, J. Kim, L. H. Lewis, K. R. Coffey, M. F. Toney, A. J. Kellock, and J.-U. Thiele,Journal of Applied Physics, Vol. 95, Issue 11, part 2, pp. 7501-7503, June 2004. L. An, W. Xu, S. Rajagopalan, C. Wang, H. Wang, J. Kapat, L. Chow, Y. Fan, L. Zhang, D. Jiang, B. Guo, J. Liang and R. Vaidyanathan. "Carbon nanotube reinforced polymer-derived ceramic composites" Advanced Materials, 16, 2036-2040 (2004). W. Yang, H. Miao, Z. Xie, L. Zhang and L. An. "Synthesis of silicon carbide nanorods by catalyst-assisted pyrolysis of polymeric precursor" Chemical Physics Letters, 383(5-6) 441-444 (2004). L. Bharadwaj, Y. Fan, L. Zhang, D. Jiang and L. An. "Oxidation behavior of a fully dense polymer-derived amorphous silicon carbonitride ceramic" Journal of the American Ceramic Society, 87(3) 483-486 (2004). W. Yang, Z. Xie, J. Li, H. Miao, L. Zhang and L. An. "Growth of platelike and branched single-crystalline Si3N4 whiskers" Solid State Communications, 132, 263-68 (2004). L. An, Y. Wang, L. Bharadwaj, Y. Fan, L. Zhang, D. Jiang, Y. Sohn, V. Desai, J. Kapat and L. Chow. "Silicoaluminum carbonitride with anomalously high resistance to oxidation and hot corrosion" Advanced Engineering Materials, 6, 337-40 (2004). H. Jin, L. Zhang, Z. Zheng, X. Kong, L. An and D. Shen. "Exciton tunneling in ZnCdSe quantum well/CdSe quantum dots" Acta Physica Sinica, 53 (9), 3211-3214 (2004). C.K. Lee, Y.H. Sohn, “Use of Modern Non-Destructive Techniques in High Temperature Degradation of Materials and Coatings” International Journal of Korean Welding Society, Vol. 3 (2003) pp. 29-39. L.D. Xie, Y.H. Sohn, E.H. Jordan and M. Gell, “The Effects of Bond Coat Grit Blasting on the Durability and Thermally Grown Oxide Stress in an Electron Beam Physical Vapor Deposited Thermal Barrier Coatings,” Surface and Coatings Technology, Vol. 176 (2003) pp. 57-66. W. Fei, S.C. Kuiry, Y.H. Sohn, S. Seal, “Sol Gel Alumina Coating on Fe-Cr-Al-Y Fibre Media for Catalytic Converters,” Surface Engineering, Vol. 19 (2003) pp. 189-194. J. Y. Fang, W. Ma, J. Selinger, R. Shashidhar, “Imaging Biological Cells Using Liquid Crystals”. Langmuir 2003, 19, 2865. (It is featured on the cover of Langmuir and highlighted in Research News of Nature Materials 2004 and News of Biophotonics International Magazine 2004). C. D. Geddes, Gao, H.; Gryczynski, I.; Cryczynski, J. Y. Fang, J. R. Lakowicz, “Metal-Enhanced Fluorescence due to Silver Colloids on a Planar Surface: Potential Applications of Indocyanine Green to in Vivo Imaging”. Journal of Physical Chemistry A 2003, 107, 3443. C. D. Geddes, A. Parfenov, D. Roll, J. Y. Fang, J. R. Lakowicz, “Electrochemical and Laser Deposition of Silver Particles for Use in Metal-Enhanced Fluorescence”. Langmuir 2003, 19, 6236. B. R. Ratna, C. M. Soto, L. Danner, A. S. Blum, J. Y. Fang, Lin, J. E. Johnson. “Complex Pattern Formation by Cowpea Mosaic Virus Nanoparticles.” Langmuir 2003, 19, 489. J. Melicka, I. Gryczynsji, B. Maliwal, J. Y. Fang, J. R. Lakowicz, “Fluorescence Spectral Properties of Cyanine Dye-Labeled DNA-Near Silver Particles”. Biopolymer 2003, 72, 96. J. Melicka, I. Gryczynsji, J. Y. Fang, J. R. Lakowicz, “Fluorescence Spectral Properties of Cyanine Dye-Labeled DNA-Oligomers on Surfaces Coated with Silver Particles”. Analytical Biochemistry 2003, 317, 136. J. Melicka, I. Gryczynsji, J. Y. Fang, J. R. Lakowicz, “Increased Resonance Energy Transfer between Fluorophores Bound to DNA in Proximity to Metallic Silver Particles”. Analytical Biochemistry 2003, 315, 160. "Angle-dependent switching of granular and multilayer perpendicular media," T. Thomson, K. R. Coffey, and J.-U. Thiele, IEEE Transactions on Magnetics, Vol. 39, Issue 5, pp. 2314-2316, Sept. 2003. "Angle dependent magnetization reversal of thin film magnetic recording media," K. R. Coffey, T. Thomson, and J.-U. Thiele,Journal of Applied Physics, Vol. 93, Issue 10, pp. 8471-8473, May 2003. Y. H. Sohn and M. A. Dayananda, “Diffusion Studies in the β(B2), β’(bcc) and γ(fcc) Fe-Ni-Al Alloys at 1000°C”, Metallurgical and Materials Transactions A, Vol. 33A (2002) pp. 3375-3392. E.Y. Lee, Y.H. Sohn, S. Jha, J.W. Holmes and R.D. Sisson, Jr., “Phase Transformations in Ceria Stabilized Zirconia Thermal Barrier Coatings”, Journal of the American Ceramic Society, Vol. 85 (2002) pp. 2065-2071. D. Goberman, Y. H. Sohn, L. Shaw and M. Gell, “Microstructural Development of Al2O3-13wt.%TiO2 Plasma Sprayed Coatings Derived from Nanocrystalline Feed Powders”, Acta Materialia, vol. 50 (2002) pp. 1141-1152. J. R. Lakowicz, Y. B. Shen, S. A’Auria, J. Malicka, J. Y. Fang, I. Gryczynsji. “Effects of Silver Island Films on Fluorescence Intensity, Lifetimes and Resonance Energy Transfer”. Analytical Biochemistry 2002, 301, 261. J. Melicka, I. Gryczynsji, J. Y. Fang, J. R. Lakowicz, “Photostability of Cy3-Labeled DNA in the Presence of Silver Particles”. Journal of Fluorescence 2002, 12, 439. J. Y. Fang, C. Soto, T. Lin, J. Johnson, B. R. Ratna, “Complex Pattern Formation by Cowpea Mosaic Virus Nanoparticles”. Langmuir 2002, 18, 308. "Angular dependence of the switching field of thin film longitudinal and perpendicular magnetic recording media," K. R. Coffey, T. Thomson, and J.-U. Thiele,Journal of Applied Physics, Vol. 92, Issue 8, pp. 4553-4559, Oct. 2002. "Temperature dependent magnetic properties of highly chemically ordered Fe55-xNixPt45 L10 films," J.-U. Thiele, K. R. Coffey, M.F. Toney, J.A. Hedstrom, and A.J. Kellock, Journal of Applied Physics, Vol. 91, Issue 10, pp. 6595-6600, May 2002. R. Raj, A. Saha, L. An, D.P.H. Hasselman and F. Ernst. "Ion exchange at a metal-ceramic interface" Acta Materialia, 50, 1165-1176(2002). Y. Liu, L. Liew, R. Lou, L. An, V.M. Bright, M.L. Dunn, J.W. Daily and R. Raj. "Application of microforging in SiCN MEMS structure fabrication" Sensors and Actuators: A. Physical, 95 (2-3): 143-151 (2002). L. Liew, Y. Liu, R. Luo, T. Cross, L, An, V.M. Bright, M.L. Dunn, J.W. Daily, R. Raj. "Fabrication of SiCN MEMS by photopolymerization of pre-ceramic polymer" Sensors and Actuators: A. Physical, 95 (2-3): 120-134 (2002). M. Gell, E. H. Jordan, Y. H. Sohn, D. Goberman, L. Shaw, T. L. Bergman, B. Cetegen, S. Jiang, M. Wang, T. D. Xiao, Y. Wang, P. Strutt, “Development and Implementation of Nanostructured Ceramic Coatings”, Surface and Coatings Technology, vol. 146-147 (2001) pp. 48-54. Y.H. Sohn, R. R. Biederman, and R. D. Sisson Jr., E. Y. Lee, B. A. Nagaraj, “Microstructural Characterization of Thermal Barrier Coatings on High Pressure Turbine Blades”, Surface and Coatings Technology, vol. 146-147 (2001) pp. 132-139. Y.H. Sohn, K. Vaidyanathan, M. Ronski, E. Jordan and M. Gell, “Thermal Cycling of EB-PVD/MCrAlY Thermal Barrier Coatings: II. Evolution of Photostimulated Luminescence”, Surface and Coatings Technology, vol. 146-147 (2001) pp. 102-109. Y.H. Sohn, J.H. Kim, E. Jordan and M. Gell, “Thermal Cycling of EB-PVD/MCrAlY Thermal Barrier Coatings: I. Microstructural Development and Spallation Mechanisms”, Surface and Coatings Technology, vol. 146-147 (2001) pp. 70-78. E. P. Jordan, M. Gell, Y. H. Sohn, L. Shaw, D. Goberman, S. Jiang, T. D. Xiao, Y. Wang and P. Strutt, “Fabrication and Evaluation of Plasma Sprayed Nanostructured Alumina-Titania Coatings with Superior Properties”, Materials Science and Engineering A, vol. 301 (2001) pp. 80-86. J. Y. Fang, M. S. Chen, R. Shashidhar, “Photodimerization-Induced Positional Order in Self-Assembled Monolayers of Alkylsilanes”. Langmuir 2001, 17, 1549. J. Y. Fang, G. Whitaker, M. S. Chen, J. Naciri, R. Shashidhar, “Synthesis and Photodimerization of Self-Assembled Monolayers of 7-(8-Trimethoxysilane) Octenyloxy Coumarin”. Journal of Materials Chemistry 2001, 12, 2992. US Patent 6,181,245; Issued 01/30/2001, "Magnetomechanical electronic article surveillance marker with bias element having abrupt deactivation/magnetization characteristic." Inventors: Copeland, Richard L.; Coffey, Kevin R..
P.A. Ramakrishnan, Y.T. Wang, D. Balzar, L. An, C. Haluschka, R. Riedel and A. Herman. "Silicoboron-carbonitride ceramics: A class of high-temperature, dopable electronic materials" Applied Physics Letters, 78, 3076-78 (2001). A.M. Hermann, Y.T. Wang, P.A. Ramakrishnan, D. Balzar, L. An, C. Haluschka and R. Riedel. "Structure and electronic transport properties of Si-(B)-C-N ceramics" Journal of the American Ceramic Society, 84(10), 2260-2264 (2001). R. Raj, L. An, S. Shah, R. Riedel, C. Fasel and H.-J. Kleebe. "Oxidation kinetics of an amorphous silicon carbonitride ceramics" Journal of the American Ceramic Society, 84 (8), 1803-1810 (2001). L. Liew, W. Zhang, L. An, S. Shah, R. Lou, Y. Liu, T. Cross, K. Anseth, V. Bright and R. Raj. "Ceramic MEMS – new materials, innovative processing and futuristic applications" American Ceramic Society Bulletin, 80(5), 25-30 (2001). L. Liew, W. Zhang, V.M. Bright, L. An, M.L. Dunn and R. Raj. "Fabrication of SiCN ceramic MEMS using injectable polymer-precursor technique" Sensors and Actuators: A. Physical, 89[1-2], 64-70 (2001). Z. Peng, W. Si, S. Lin, H. Miao and L. An. "Advances of ultrahigh temperature ceramics derived from organo-silicon polymers" Journal of Inorganic Materials, 16(5): 779-790 (2001).